The creative team behind Stargate Universe, the first several episodes of which were released recently on DVD, deserves credit for making a highly derivative show interesting. The basic concept of Stargate is that a series of large stone-like rings, including the surviving one on earth, create temporary wormholes that connect planets across the universe. Further, the lore behind the show is very interesting and makes owning Universe and the other two series in the franchise worthwhile. Universe continues the borrowing from Star Trek: Voyager that began with the final season of Stargate: Atlantis by having an attack on a Stargate Command base force a group of military personnel and civilians to escape through a stargate. These individuals end up on the incredibly old unmanned spaceship Destiny that is at the other end of the universe from earth. Like Voyager, the effort to return to earth is the goal of the crew. As of the end of the first half of the first season, these reluctant space travelers lacked control over the speed or the course of the ship. The Destiny was created by the same highly advanced group of aliens, known as the Ancients, who invented the stargates and installed them on hundreds of planets. One twist is that the Destiny is much older than the very ancient technology with which Ancient and stargate experts are familiar. Universe is also similar to the modern version of Battlestar Galactica in that the ship is outdated, the lighting and tone of the show are rather dark, there is liberal use of shaky hand-held cameras that depict realism but can also create slight nausea, and there is regular and heated conflict. The first batch of episodes include very harsh treatment of characters who do not get with the program and even a purposeful shooting of someone who was risking his own life. The general lack of heroism is another parallel with Galactica. Expedition leader Col. Young is a deeply troubled individual whose leadership style utilizes a stick much more than a carrot. Further, head science guy Dr. Nicholas Rush is more like Dr. Zachery Smith than Dr. Daniel Jackson in that he is responsible for bringing the crew to the ship and also seems to be concerned about the welfare of his colleagues only when that coincides with his own objectives. The one hero is the 20-something Lt. Scott, who is likable and seems to just want to be a good soldier and take care of his people. I would like to see him as a field trainer if the occasionally discussed Stargate Academy series is developed. Universe is additionally like Stargate: Atlantis in that it involves transporting a group of humans to an Ancient facility in a manner that drains the resources of that asset. In contrast to the Atlantis crew marching bravely through the earth stargate excited about seeking out new life and new civilizations, the Universe folks come frantically crashing through onto the ship in a manner that reflects the change in our national outlook since Atlantis premiered several years ago. Like any good sequel, Universe introduces new technology; the coolest example is the ability of the Destiny to travel on its own initiative to a place that has a resource that survival requires. The pilot, no pun intended, episode has the Destiny stop at a planet that has the mineral that repairing the ship’s life-support system requires. The next few episodes follow similar themes. Recognizing that the series could not always relay on the gimmick of the Destiny locating a needed resource, the last few episodes of S. 1.0 involve things such as a risky rescue plan and a murder on the ship. I hope deeply that the Destiny encounters some aliens and finds a nemesis. My primary complaint is that using Ancient technology to allow crew members to temporarily return to earth in the bodies of people who live here detracts from the show. First, it adds an element of primetime soap to the show. Second, it makes the same mistake as the later seasons of Voyager in reducing the isolation and making the overall peril less intense. Further, showing nice clean homes and sunny days really hurts the effectiveness of the dark tone of the show. The extras are very good but far too short; seeing the enthusiasm of the cast members and watching them behind the scenes was interesting, but each one only got a few minutes. I also loved the primers on Stargate lore that Michael Shanks presented as his character of Dr. Jackson, but these also should have been longer. Jackson’s personal experience regarding ascension made that segment the best of a good group. I am genuinely interested in what other Stargate fans think of Universe and would love to hear from new converts as well. My e-mail address is tvdvdguy@gmail.com. 3-disc set includes 10 episodes from season one. A group of soldiers, scientists and civilians fleeing an attack, is stranded billions of miles from Earth on an Ancient ship known as the Destiny. Locked on an unknown course, they must fight to survive and find a way home. The danger, adventure and hope they find on board the Destiny will reveal the heroes and villains among them. 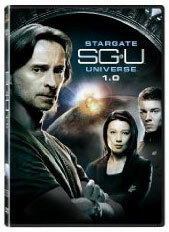 Starring Robert Carlyle, Ming Na and Lou Diamond Phillips, as well as returning Stargate favorites.